A Language Revitalization workshop was held over 4 days in July 2013 in Kolonia, Pohnpei State, Federated States of Micronesia (FSM) hosted by the Island Research Education Initiative (IREI) and the FSM National Dept. 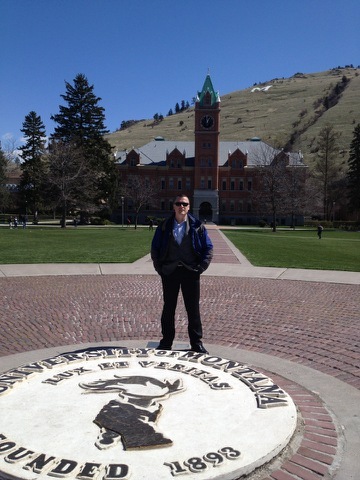 of Education and Special Education Program. 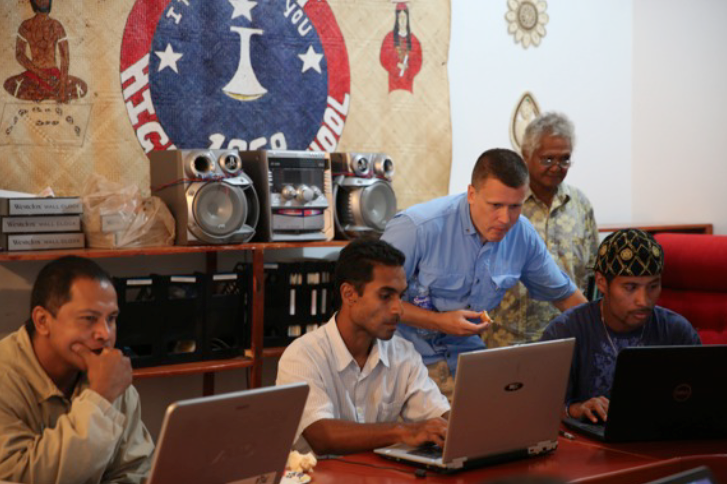 Greg Anderson and David Harrison of the Living Tongues Institute led the workshop, which aimed to leverage new digital technologies in support of Micronesian languages. Yvonne Neth of IREI was the local coordinator and partner. John Curley; Leilani Welley-Biza and Darlene Apis representing Pingelapese; Howartson Heinrich, Kapingamarangi language speaker; Arthur Albert representing Kosraean; and Pressler Martin and Mario Abello representing Pohnpeian. We covered a variety of topics, including audio recording techniques, word and sentence elicitation, photo elicitation, lexicography, and building talking dictionaries. Further, the participants began building nine new Talking Dictionaries, and beta-tested a new interface that allows speakers to edit and record lexical items directly via their web browsers. The nine dictionaries created during the workshop currently have nearly 12,000 lexical entries, many with soundfiles, and some with cultural photos. Community members will continue to expand these in the near future, and will use them in language revitalization efforts. Following the workshop, the team visited remote Mwoakilloa Atoll, a landmass of only 0.8 square miles located in the outer reaches of Pohnpei State in the FSM. Here we continued work on the Mokilese language and collected words, sentences and folk stories from both elder and younger speakers in Mokilese. These will be added to the Mokilese Talking Dictionary and our YouTube video channel in coming months. 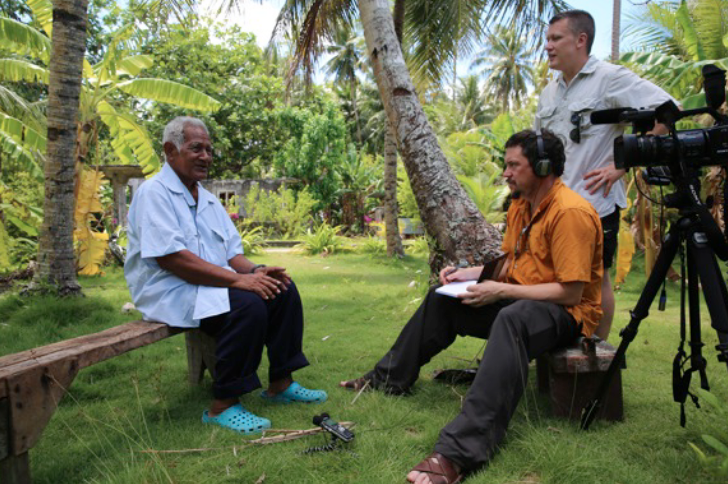 We observed and conducted interviews about oral history, traditional foodways, fishing, outrigger canoe building, and navigation technology. Mwoakilloa represents a unique and endangered speech community within Micronesia, as the Atoll has a permanent population of under 100 people. 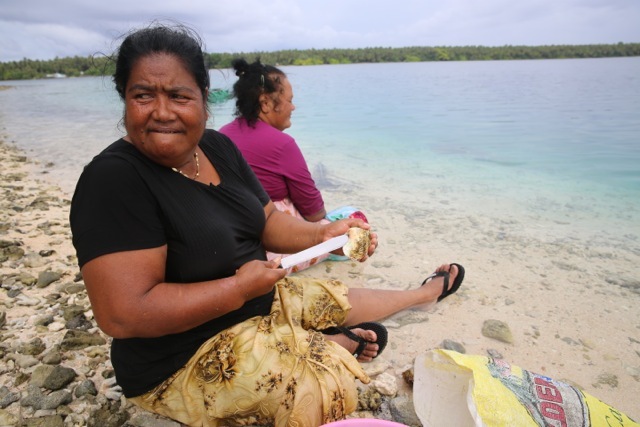 With most Mowoakilloans living away from the atoll, the language is vulnerable. At the same time, the community has mounted ambitious efforts, including a new Bible translation, children’s books, and the Talking Dictionary in an attempt to stabilize the language. 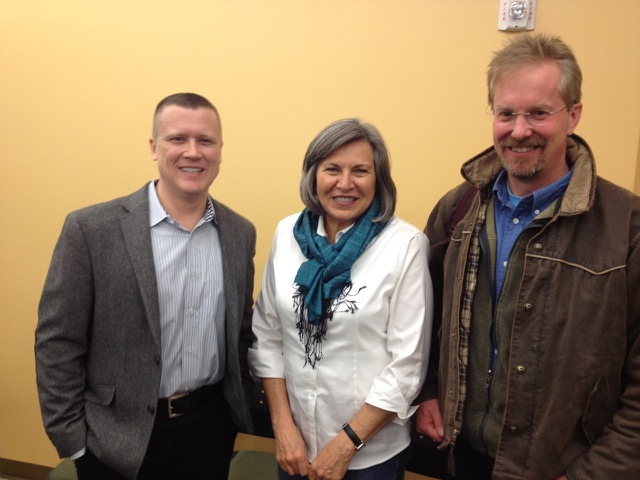 We are grateful to Roz Ho and Jack Daulton for providing financial and technical support during the expedition. Jeremy Fahringer at Swarthmore College developed nine new Talking dictionaries for the workshop. Taking part in both the workshop and the trip to Mwoakilloa was Yvonne Neth, Vice-Director of IREI. Jack Daulton and Roz Ho elicit and record Pingelapese words with Leilani Welley-Biza. Johnny Rudolph, and Maynard Henry. Photo Jack Daulton. Harrison and Oliver Anderson. Photo Jack Daulton. Day 3 of the workshop, at the FSM Department of Education. Photo Jack Daulton. Ichiro John, Mwoakilloan elder, interviews with Greg Anderson and David Harrison. 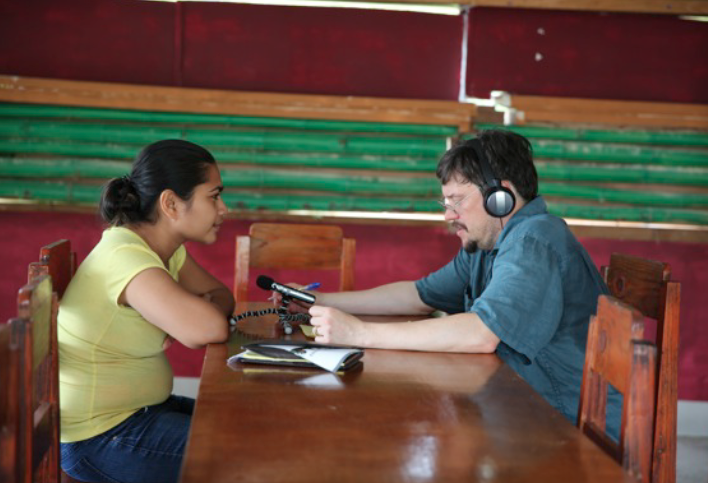 Caroline Dabugsiy, Yapese speaker, records with Greg Anderson. Photo Jack Daulton. Howartson Heinrich builds the Kapingamarangi Talking Dictionary. Photo Jack Daulton. 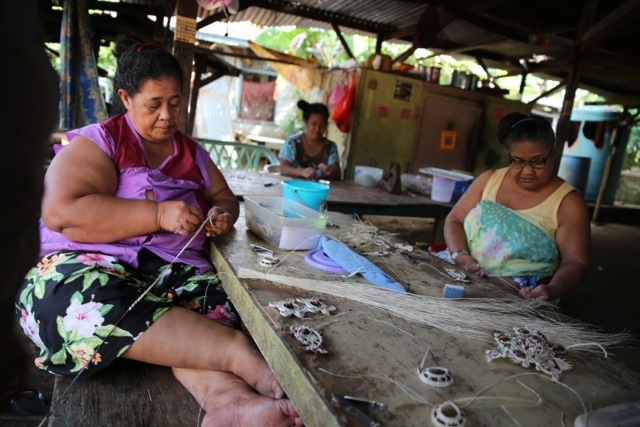 Kapingamarangi women in Pohnpei making traditional handicrafts. Photo Jack Daulton. Maria Matthias and Carolina Joel shelling clams they harvested from Mwoakilloa lagoon. Traditional Mwoakilloan outrigger canoe (war), built by Abram Joel. Photo Jack Daulton. Of the nearly 7,000 languages spoken in the world today—many of them unrecorded—up to half may disappear in this century. As languages vanish, communities lose a wealth of knowledge about history, culture, the natural environment, and the human mind. The One World, Many Voices: Endangered Languages and Cultural Heritage program at the 2013 Smithsonian Folklife Festival will highlight language diversity as a vital part of our human heritage. Cultural experts from communities around the world will demonstrate how their ancestral tongues embody cultural knowledge, identity, values, technologies, and arts. Through performances, craft demonstrations, interactive discussion sessions, community celebrations, and hands-on educational activities, highly skilled musicians, storytellers, singers, dancers, craftspeople, language educators, and other cultural practitioners will come together on the National Mall to share their artistry, knowledge, and traditions; to discuss the meaning and value of their languages to their cultural heritage and ways of life; and to address the challenges they face in maintaining the vitality of their languages in today’s world. Festival visitors will be able to talk with Kalmyk epic singers and Tuvan stone carvers from Russia, Koro rice farmers from India, Passamaquoddy basketmakers from Maine, Kallawaya medicinal healers and textile artists from Bolivia, Garifuna drummers and dancers from Los Angeles and New York, and many others. When a language disappears, unique ways of knowing, understanding, and experiencing the world are lost forever. The expert culture bearers participating in the One World, Many Voices program will richly illustrate these different ways of knowing and show how cultural and language diversity enrich the world. The One World, Many Voices program is produced by the Smithsonian Center for Folklife and Cultural Heritage in collaboration with UNESCO, the National Geographic Society’s Enduring Voices Project, and the Smithsonian’s Recovering Voices Initiative. Open daily 11 a.m. to 5:30 p.m.
A full schedule will be available in June 2013. Tarek Milleron, Dave Prine, Jessica Illman, Anna Belew, Michael A. Hall, Allison Taylor-Adams, Laetitia Chaneac, Julie Kanakanui, Barbara Partee, David Robinson, Arpiar Saunders, Eric Raimy, Molly Allison-Baker, Robert Munro, Nori Heikkinen, David Nolin, John Ziker, Lee Wilson Ballard, Emily Gref, Mikael Siren, Ryan Henke, Robert Wessling, Sarah Truesdale, Katherine Vincent, Claire Catania, Ulrike Christofori, Boise State Linguistics Lab, Walid Saleh, Chris Donlay, Debbie Anderson, Carla Hurd, Fran Osborne, Laurence Cotton, Sema Balaman, Kimberly Jackson, Sarah Laskin, Audrey Van Herck, James Glenz, Edward Hess, Carley Hydusik, Tamra Wysocki-Niimi, Carl Franco, Bryony Rigby, William Graeper, Tania Reino, Ilona Staples, Nancy Mariano, Stephen Holt, Alex Francis, Alex Sinton, Carole Smith, Bewenca, M. Skelly, Les and Janice Lederer. This is K. David Harrison writing to you to let you know there are 36 hours left in our fundraising campaign to raise money for creating new Talking Dictionaries in Papua New Guinea. Your gift will go towards training students to create cutting-edge Talking Dictionaries for some of the world’s most under-documented languages. Please consider donating today. For those of you who have already donated, I want to say thank you for you generosity, and for helping language activists and linguists to safeguard linguistic diversity around the world. 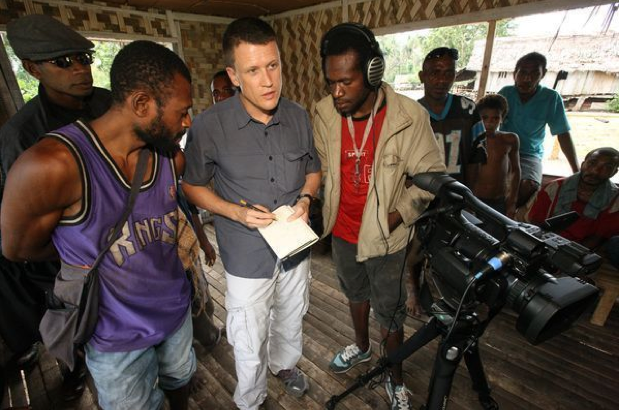 K. David Harrison working with speakers of the Matukar language in Papua New Guinea. Photo by Chris Rainier. Gibe and Pipe, Huli wigmen, in the Southern Highlands of Papua new Guinea. Traditional ceremonial paint colors: Mali-ambua-hare, Waterfall: Iba-Fugu. Photo by Chris Rainier. This post is about our fundraising campaign on Indiegogo. We have 9 days left to raise $2750 that will go towards creating new Talking Dictionaries in Papua New Guinea. Please consider donating. Thank you for your support. Background. Every two weeks, the last fluent speaker of a language dies, and humanity loses another language. Nearly half of the world’s languages are likely to vanish in the next 100 years. 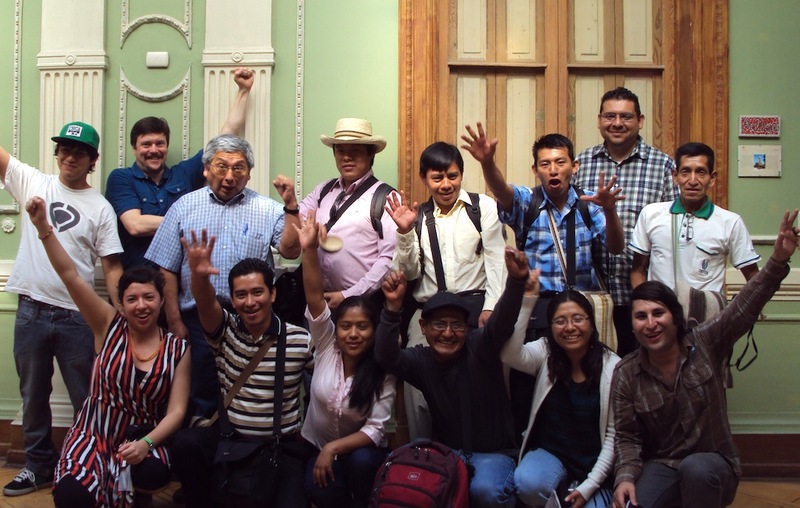 Over the last decade at Living Tongues Institute for Endangered Languages, we have worked with hundreds of people dedicated to endangered language documentation around the world. Through community collaboration, we have made some of the first-ever digital recordings of dozens of endangered languages, and we have traveled to many countries to train language activists in documentation techniques that can help preserve their cultural and linguistic legacy. Papua New Guinea’s Languages. The island nation of Papua New Guinea (PNG) represents the greatest single concentration of linguistic diversity on earth, with 830 listed languages identified thus far, and an unknown number remaining to be scientifically documented. Without PNG, no survey of the world’s languages would be complete, nor would our understanding of the current global process of languages extinction. With so many of PNG’s languages being undocumented and in danger of disappearing, now is the time to start creating recordings of these languages, and helping local activists and students to create materials that can preserve their languages for the future. Our goal is to teach a 4-day digital media skills workshop at the Papua New Guinea University of Technology (UNITECH) in which local indigenous students will learn how create new Talking Dictionaries for their own native languages. We have been invited by local scholars in Papua New Guinea to give this workshop later this year in October (2013), and we are raising the funds to make it happen. Please donate! Our workshop is partially funded thanks to grants and donors, but we need a further $2750 to help cover the rest of our equipment and travel costs. Over 50 different local languages are represented at UNITECH. We aim to create Talking Dictionaries for 12 languages to start with, and then return once a year for the next 4 years to continue building more dictionaries with the students. This will be the 4th time we teach a digital skills workshop of this kind, and the first time in the Pacific. Check out pictures and write-ups from our previous workshops for speakers of endangered languages (organized in collaboration with National Geographic) held in Santa Fe, New Mexico (USA); Shillong, Meghalaya (Northeast India) and Santiago (Chile). What is a Talking Dictionary? It takes the traditional paper dictionary to a whole new level. It is an interactive online tool that digitally preserves words and phrases, and it allows the user to hear high-quality audio recordings of words in their language, as well as record and upload new content. The tool is a powerful educational tool for communities that are trying to revitalize their endangered languages. The online dictionary is programmed to be bilingual so that speakers of the local dominant language can easily use it. It serves as a resource to help fluent speakers teach their native language to a new generation of speakers. Talking Dictionaries help create visibility for minority languages on the Web. They are a virtual space where speakers can go to listen to their language, no matter where they are in the world. Take a minute to check out our Talking Dictionary Portal, and our new site for the Talking Dictionaries of Latin America. Why We Can Make a Difference: At the Living Tongues Institute for Endangered Languages, we are a small and dynamic team with a low overhead. We coordinate big long-term projects, such as the Talking Dictionaries, on a modest budget. Supporting us is a great way to support the creation of tools that will preserve threatened languages for future generations of speakers. Thanks to a Talking Dictionary, you can listen to forms of human speech that you’ve never heard before, and get a further glimpse into the rich diversity of languages spoken on our planet. We have a good relationship with a number of communities in Papua New Guinea because we have done language documentation there in the past. 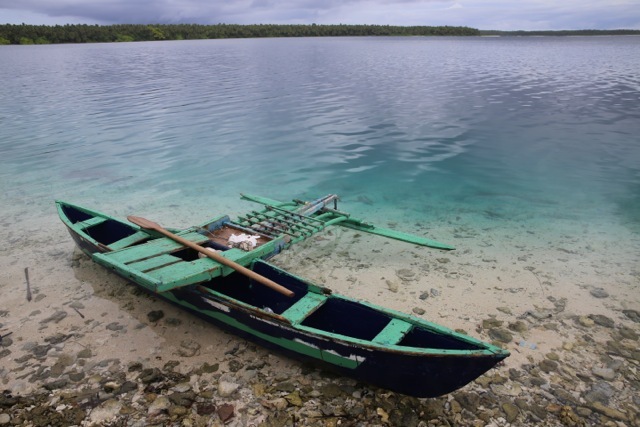 Here are some images from our fieldwork in Papua New Guinea in 2009. Please donate online to our fundraising campaign!